Cort the Sport: OH. So that's what I signed up for. OH. So that's what I signed up for. Last April I did the USAT Long Course Duathlon Nationals in nearby Cary, NC. I did it because it wasn't far away and it was something different. It was my first duathlon. There wasn't much "long course" about it with a 5 mile run, 31 mile bike, and 5 mile run. It was a small field (I think we had two waves), had a local race feel (less than 200 people in the race), and I won my age group, out of 9 people. It was very laid back. Our little race kind of flew under the radar. I noticed later in the season - in June - there was a much bigger USAT Duathlon Nationals in Bend Oregon that got a lot of press. I see something that says USAT and Duathlon and Nationals, again in April, a little further south in Greenville, SC. I figure it's basically the same race that I did. The race is this coming weekend. Yesterday I finally took a few minutes to look at the race website. 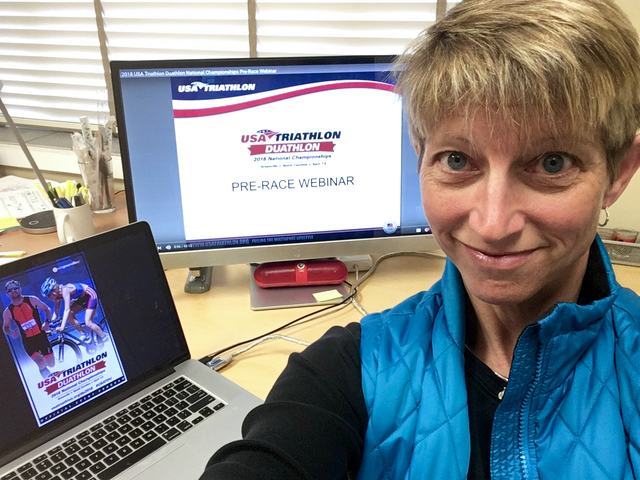 My first clue that it's not the same race is that I see an official Pre-Race webinar and full Athlete Guide. I see they are closing the roads for the race. Then I realize over 1000 people are expected for the three races. This year there is just ONE Duathlon Nationals and this is it. It is attracting top athletes from across the country. There are 28 in my age group for Standard Distance Non-Drafting coming from Colorado, Florida, Georgia, Idaho, Indiana, Massachusetts, North Carolina, New Hampshire, New Mexico, Nevada, Ohio, Oregon, Rhode Island, South Carolina, Tennessee, Texas, and Virginia. Among them are names I see routinely on the podium at Age Group Nationals. Not that this changes anything, but suddenly I'm feeling like oh $hit maybe I should have been working harder or running further or just giving the prep a bit more of the respect it deserved! So I'm wrapping my head around the vision of a slightly different experience for the coming weekend!! LOL. I am preparing to be humbled! Coach Jim of course has just the right words to give me the proper perspective: "Just go run, ride and run like you enjoy doing…and then you can look at the results once you are done. I’m excited that you are healthy and enjoying your training and hopefully looking forward to racing again!" Yes! I am looking forward to running and riding on closed courses and seeing what I can do at this point. It's still very early in the season and it's fun to feel my strength and fitness building back again. My goal through the efforts of this race are to find FLOW, and as always, to stay positive! !